Recently had: new brake pads on the front, new brake lines on the rear, new rear shocks, front wheel bearing etc. No expense spared! You would struggle to find another e46 in this condition. It’s only covered 108k and has a years mot. HAS DEVELOPED A FAULT WARNING LIGHT ON THE DASH, REVS UP AND DOWN WHEN COLD. RUNS OK WHEN WARM. SPARES OR REPAIRS. for sale my bmw 323i. its in exellent condtion, has signs of age but nothing serious. 2001, BMW E38 735i V8 in very good condition in and out, alot of money spent on this car, 93000 mileage, 11 months MOT with no advisories, Alpina Front Splitter, Boot Lip Spoiler, Spax RSX Coilovers with adjustable dampening for smooth ride costing £850, 21" Original Alpina Anthracite Alloys in immaculate condition costing near to £2000, Sat Nav, AC, Electric Sunroof and Electric Windows front and back and service history. Bluetooth CD player Read less. BMW 3118 I M sport 2.0 L petrol. Ok Read less. Cream leather interior. All extras as is a BMW. A great engine and a smooth auto transmission. This BMW 635 CSI 3.5 ltr automatic, Could either be a donor car or the start of a project itself Everything on this car is original and present, there is nothing wrong with this car mechanically it has always been a good running car, but was parked up five years ago and has not moved since, All paperwork is present and correct. You would have to arrange your own transport ie trailer. The gearbox, brakes, and the steering all appear to operate and perform as they should. Car is in good condition and shows no undue signs of wear or tear but would benefit from a valet. So, it now has last year's failures rectified, and a fresh MoT. Not interested in another car, a quad or any chinese bikes. I don't have a buy it now, and will not break it for parts. It's sat for a year, so i'm obviously not in a mad rush to get rid of it. 1 previous owner (you would be the 2nd). Full leathers and alloys all round. well looked after as all receipts for car to show from new keeper. Full service history from new. The cars a nice colour and spec. HPI clear. Full logbook. Current MOT cert expires August 2019. All owners manuals etc in original BMW wallet. the car has been regularly serviced. Front Shocks. New Discs and Pads. MOT is 18th June. (in case it can't be seen from the photos I should point out that the black bumpers and wing mirrors have silver glitter on them. I will attempt to remove this too 😕) tis only a craft paint. BMW 528i e39 auto. Since owning the car I've upgraded the front and rear lights to the more desireable facelifted design (both genuine BMW). This incorporates the well known halo ring sidelights on the front, finished with crisp clear white LED's. Two part worn tyres included on 7mm of tread. Spare alloy wheel included. Slightly noises clutch release bearing but does not affect performance at all. New aux belt. Bad Points Camber adjustable front top mounts (nearly new standard ones included). SOLD THEREFORE FOR SPARES OR REPAIRS,DRIVE IT AWAY! 2008 BMW 750LI 4.8 LITRE AUTOMATIC IN BLACK. By now you now understand this item is going to require further money to be spent on it due to its age, mileage and price paid. The car has been stripped out and all unnecessary wiring removed. I was planning to put the car through an MOT so it could be driven to drift events I think if the car will need a good check, but will pass an MOT very easily. Only one owner before. A good little runner but not suited to her retired life style. Bmw e36 323i se touring Boston Green R432CGJ. 4 Owners Service history Bmw Wallet 10 month MoT. BMW 318i E46 GREEN. SPACE SAVER SPARE WHEEL, STILL HAS ORIGINAL BMW TOOL KIT. SONY CD PLAYER WITH AUX IN, ORIGINAL BMW PLAYER ALSO AVAILABLE. ONLY 80,500 MILES AND WITH 2 PREVIOUS OWNERS. NO RUST OR DENTS WITH SCUFFS ON FRONT AND REAR SKIRTS. 1997 BMW E39 520i auto car had no rot or rust anywhere on shell. 2008 BMW 750LI 4.8 LITRE AUTOMATIC IN BLACK. Usually wear will be seen across the seats (particular the driver’s seat pillar) and door trims. Full leather. If you fail to do this the car will not necessarily be held for you. Very clean example of the BMW E38. I bought the car in Jan last year from Walkers Autotech with 118,800 miles. Its a 728i SE in Orient Blue with Sandbeige interior and walnut trim. The car is in good clean condition for its year inside and out with only the expected minor marks etc for a car of its age and mileage. 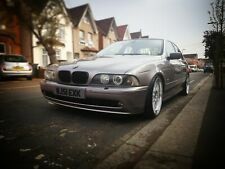 BMW 520i K Reg, MOT until 11/02/2020. 83847 miles printout from dvla to prove. Drives very good, Engine and box are excellent. Few age related marks and a few rust scabs, but never been welded and paint is all original. 2004, 3.0i sport. Full leather, Cd, BMW diamond cut alloys with 4 new Pirelli tyres, fsh, unbelievable folder of previous work done right up to present. No advisories on last MOT. Great looking car for year. BMW 740i Sport. Plate included. The exterior is shadow line. BMW 318i Se 2009 E90 Facelift. Only Down Side Is That The Car Misfires. Interior is In Brilliant Condition. Bodywork is in Fantastic Condition. Silver Interior Trim. Air Condition. GRAB A BARGAIN THESE AEGEAN BLUES FETCH HUGE MONEY ON AUTOTRADER. FULL 12 MONTHS MOT. HUGE SPEC XENON HEADLIGHTS. CAR IS IN GOOD CONDTION FOR ITS AGE, IT DOES AHVE A FEW MINOR BLEMISHES AS EXPECTEDON A 16 YEARS OLD CAR. MOT NOV/19 + LEATHERS + PART EXCHANGE WELCOME? MOT Expiry - 26th July 2019. 2004 BMW 318I 2.0 SPORT MANUAL IN BLACK IMMACULATE. Parking Sensors. Usually wear will be seen across the seats (particular the driver’s seat pillar) and door trims. If you fail to do this the car will not necessarily be held for you. Superb Parallel alloy wheels with good tyres. This is an exceptionally rare car, especially given its a long-wheel base and an 'Individual' spec car finished in amazing Mora purple. November 1999 BMW 750IL E38. For sale is my 318i saloon 2.0 petrol 2008. UPGRADED ALLOY WHEELS !! LOOKS AMAZING !! Original CD Player AM/FM. Heated seats. Autotech Sales and Servicing - Call us on 441443805111 or click here to find out more. vpi used car sales ltd - Call us on 442039122470 or click here to find out more.